Laugh with Ash: Pictures are important. My family and I are going to get Maternity pictures done today and I’m really quite excited about it. I actually won the photo shoot in a giveaway through the photographer’s facebook page (check out Simply Ania, I’ll be sure to post some of today's shots when they're available). Anyway, I was telling my dad about getting pictures done and he thought I ought to just wait until the baby was born and then have them done. I’m going to do both, but he seemed to think that was kind of pointless. I don’t. I think pictures are important. And if I could, I’d have them done professionally every month. Okay, maybe not every month, but at least every six. Unfortunately, my budget just doesn’t cut it. I’ve always been a photo fanatic but today I really thought about why. Why are they important to me? Photos capture the moment, they save a memory. If for some reason I don’t make it to tomorrow, I want my children to remember me. I want them to remember the love I have for them. I want them to see how happy I am when they are around. And if I make it to the day my great-great grandchildren are born, then that’s just wonderful and I’ll have a stockpile of photos ranging from incredibly beautiful to extremely embarrassing and I promise to share every single one of them! “A picture is worth a thousand words,” they really are and yet sometimes I find myself speechless looking at photos. 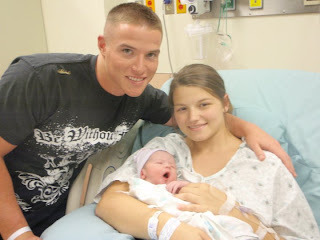 I look at pictures from the day Keegan was born and it sometimes brings tears to my eyes. I love that day, and I’m so glad I have pictures to document it. Someday I’ll show Keegan and he can see just how happy we were to have him, to bring him home, and to have him brighten our lives. You can see that in a picture. I can look at those photos and feel what I felt that day. I can hardly believe that was almost two years ago. And I know in 10 years, I’ll find myself baffled that 12 years flew by. I don’t have many photos, other than school yearbooks, pre-dating high-school. And I do not have a single family photo from when I was a kid. Not one. I don’t think such a thing even exists. My dad isn’t much of a camera man, for whatever reason, but he won’t be around forever. One can only hope that God will give us plenty of time to make memories, but nothing is guaranteed. And if he were to go tomorrow, I would have no photos to show my children. Keegan has only met him once, at nine months old, and the new baby has obviously never met him. That doesn’t leave a whole lot of time for making memories, and at such a young age, how much will they really remember? So, I will take my maternity pictures today and I will take newborn pictures when the baby is here. I will take family photos every year and I will take snapshots with my own camera every day of my life because I want to remember this. And I want my kids to remember this. And their kids to remember this. Unfortunately, our lives won’t last forever, but photos… photos are timeless, and there will be plenty that will outlive me by many, many years and I can only hope that my children, their children, their grand-children, and so-on will someday cherish those photos just as I do.